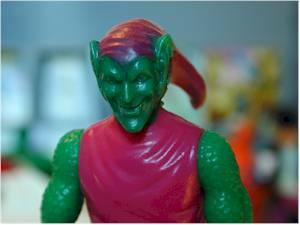 Most people believe that the first 3 3/4" figures to hit the markte were by Kenner - Star Wars. 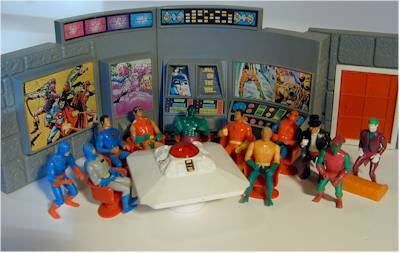 However, the Mego toy company had them beat by several years. In 1975, they produced the first line in this diminutive size - little did they know how popular this new format would become over the next 10 years. The first line the produced was called the Comic Action Heroes, and contained licensed characters from both the DC and Marvel universe. In 1978, they followed this up with the Pocket Heroes, an almost identical concept. 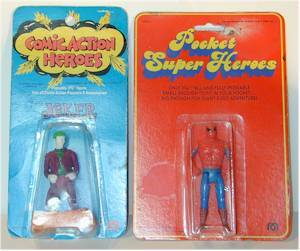 The only crucial difference - other than name and packaging of course - was that the Pocket Heroes came with straight legs, while the CAH came with legs bent at the knees. For the majority of the figures, the molds for the heads, torsos and arms were reused. In the CAH line, 12 different figures were produced. These included Wonder Woman (with lasso), Aquaman, Spiderman, Shazam, Green Goblin (with shoulder bag), Batman (with batarang/rope), Joker (with cane), Penguin (with umbrellas), Superman, Robin (the same batarang/rope as Batman), Hulk, and Captain America (with shield). Each also came with a small, orange stand, not included with the Pocket Heroes line. Finding loose figures with these accessories is very difficult - they were designed to be lost within seconds of opening the package. Quite a number of playsets and vehicles were also produced. Batman got to have a Batmobile, and Batcopter, while Superman was given a terrific Fortress of Solitude. Wonder Woman had the Invisible Jet, Spiderman got a Spidercar, and even Green Goblin got a vehicle called the Mangler. The Exploding Bridge Playset, pictured to the left, included the Batmobile and several figures. 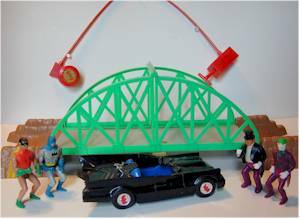 The Joker's intent was to blow up the bridge as Batman and Robin passed through, using the plunger device. Finding one of these plungers in good shape in a loose set is very hard, due to it's fragile construction. The plunger (also called an 'activator') also came with the Invisible Jet playset, and the Fortress of Solitude. For the Pocket Heroes line, the orange stands were dropped. Also, three figures were not carried over - Penguin, Joker and Shazam. Instead, with the Superman movies popular, three other figures were added - General Zod, Jor-El and Lex Luthor. Finding nice, carded examples of these figures has become increasingly difficult, and even loose figures are getting tougher to come across. In greatest demand however, are the vehicles and playsets, and some - like the Mangler - will take a lot of patience and work to find. But they are certainly worth the effort, and are another fine example of Mego's ingenuity and talent in making toys with terrific looks and play value. The gang, just hanging out around the Fortress.